You’re getting married – hooray! And you’ve got everything checked off your list – all vendors, the wedding venue, caterer, flowers, photographer and your dream dress (If you haven’t, check out this blog to help Girls Guide to the Perfect Wedding Dress). You want to make sure you look PERFECT on your wedding day – and you will! But don’t forget about your skin. 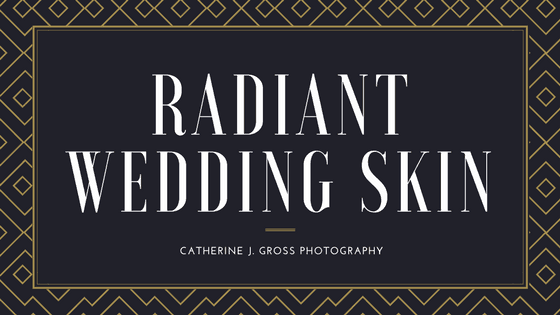 If you follow a few steps to prep, your skin will glow on your wedding day and in your photos. Here are a few tips to follow to make sure you’re looking your best! Start early and make sure you have a good skin routine in place months prior before your wedding. Part of this is making sure that you do not go to bed without thoroughly cleansing your skin. Make sure you remove all traces of makeup – especially mascara – before hitting the hay. Just one night of sleeping with makeup on your face can leave your skin looking dull, dry and the opposite of healthy (this is not just what you hear on commercials, this is soon true). So suds up! Use warm water and a facial cleanser to ensure you can put your best face forward with radiant looking skin. Looking for some fantastic skin care products? Check out these recommendations brides are using. Skin looks best when it’s hydrated so on top of drinking your eight glasses of water per day, make sure you don’t go to bed without applying a rich night cream that will hydrate your skin while you sleep. In the morning, after you wash your face again – apply a hydrating day lotion to keep your skin soft and radiant. Always make sure to reapply too to make sure your skin is getting all the moisture it needs! 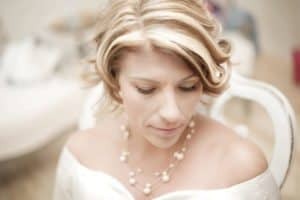 These are the top products used by many of my brides. However the links at the top will take you to several different types from each company. I love the warm rays of the sun but I don’t like what it does to my skin so I always make sure I use moisturizer that contains SPF (Just no SPF on the day of your wedding). This means my skin won’t burn and then I feel like it won’t age as fast either. On your big day – there will most likely be tears, a nervous night’s sleep the night before and a few glasses of champagne – put all those together and your eyes will look tired and droopy so make sure to get your eyes ready for the big day! Click the link to book your wedding day!